Albatross skills divers all qualify for the Swim England National Skills Final to be held in Manchester in July. The K2 leisure centre in Crawley played host to the South East Region Skills diving competition on the 10th Jun 2018. Leading the team success was Amber Cowen who won a silver medal in the girls B+ closed event with a personal best of 266.75 points. 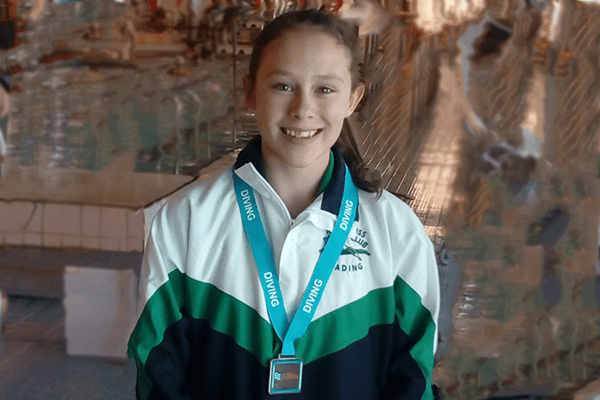 Amber dived consistently, improving on her scores for most of her dives from Kent Skills and adding a complicated and well performed back 1 1/2 somersaults tucked on 1M for 33 points and performing an excellent reverse dive on 3M scoring 36.1 points; a significant personal best. Also diving in boys B+ Open event were Zac Cooper and Harry Healey. Harry was eager to achieve the qualifying standard (250 points B+) for National Skills finals. Harry dived brilliantly with only one score below 5 out of 30 possible. All his dives were consistent and strong and Harry finished in 7th position with a total of 278.3 points; a personal best by over 50 points. Zac performed some higher tariff dives than Harry, 3 of his 3M dives scoring in the mid 30 points, to finish with 285.3 points in 5th place in a very high standard competition. In group C boys (open) Aiden Jones led the pack finishing 6th with an excellent score of 299.20. Austin Bradbury was close on his heels in 8th with 295.80. Austin’s poolside work stood out with most scores over 7 points and many 8 and 8.5 points from the judges. On 3m Austin impressed with some lovely ‘rip’ entries on his compulsory line ups. However Aiden kept a cool head during the competition, with almost all his dives scoring 7 or higher, resulting in a final score of 299.20 and an agonising 4th place in the closed event. Austin placed sixth place in the closed competition.. The SE Regional Skills Competition is an important event in the skills calendar. The event is recognised as an official qualifier and divers work extremely hard to achieve their statutory points which will allow them to compete at the prestigious National Skills Final. It is with great pride that every member of Team Albatross reached the required standard. We wish them all luck for the National final at Manchester Aquatic Centre next month.